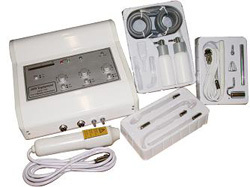 Model: SDS806“This portable case includes the tools, attachments and machinery for administerin microdermabrasion treatments with one machine. This unit includes a spray attachment and vacuum, high frequency, rotary brush and galvanic adjustments. The galvanic current softens skin while the high frequency current cleans deep down followed by the spray and vacuum which gently exfoliates skin to the desired abrasion level. Skin is left rehydrated, wrinkle and spot free and looking young and feeling healthy. please note,all shipping charges are additional to the freight amount“that appears in shopping cart when checking out and will only show up“on your invoice from us.this will not appear on your internet order.